Cardiff is the perfect place to be a student in search of part-time work. When I arrived in September to start my Masters programme every local business seemed to have a sign up advertising part-time positions. 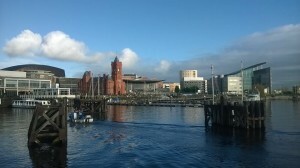 Cardiff is a city of cafes and tourist attractions so the demand for part-time and seasonal work is high. But you don’t have to venture into the City Centre and walk in and out of the winding, and modestly grand Victorian shopping arcades handing in CVs to find work. The University has its own internal careers service, the Jobshop. It’s free to use and once you’re signed up you’ll receive regular job updates via email- following the Jobshop on Facebook is also a good idea to keep up-to-date with available positions and news. There’s everything from stewarding work during large events in Cardiff to part-time or temporary administration roles within the University itself. I recently completed a few days’ translation work for a research institute based at the University. I’m studying on the MA in Welsh and Celtic Studies and as part of the programme have to undertake at least a week’s worth of work experience. My main area of study centres around language policy in Wales and I’ve been fortunate enough to gain work experience at the headquarters of Plaid Cymru. I’m working on a report on the possibility of changing the current status of the Welsh Language within European institutions and learning a great deal about how political parties and Welsh politics work. My next placement is with the National Assembly where I’m hoping I’ll learn a bit more about how Wales’ legislative body deals with the country’s two official languages. By the time I leave Cardiff in a few months’ time, I’ll have managed to flesh out my CV a bit and gained some valuable experience that I hope will stand me in good stead when I venture out into the world of work. Plus, I’ll have earned a bit of money to have kept me afloat!